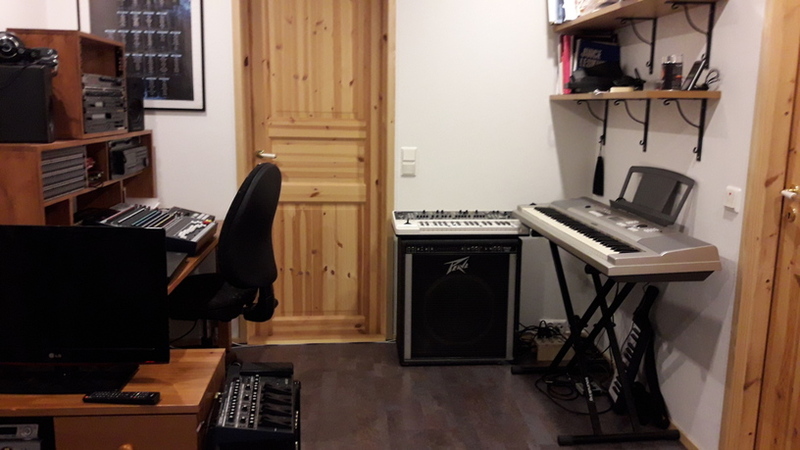 Home studio productions over the years. Except where otherwise noted, all compositions, lyrics, instruments and vocals by Panu Matilainen. Ordered newest on top. Unless otherwise noted, all songs mixed and recorded on a Soundcraft FX16 II console and Fostex D2424LV mk2 multitrack recorder, and drums + other backing tracks sequenced with Squarp Pyramid sequencer + various hardware instruments. Although the D2424LV does support digital-era features such as copy-paste edits, as a matter of principle I only do what would be possible with analog tape machines. Similarly, I try to only sequence things that I could physically play. Exceptions will be noted if they ever come up. Please keep in mind that the material here are only rough demos made for fun, and my idea of freetime fun does not include endless takes to hone out mistakes. Oh and in case you wonder, yes I'm perfectly aware what a terrible singer I am. I just find it fun, nevertheless. And then something very different. I got the idea back in 2017 while playing around with Yoshimi software synth, thinking it would be done in an afternoon but in the end it took no less than two whole years to hatch, reprogrammed entirely on the Pyramid + Roland JV-1080, U-220 and Gaia synths. I had trouble finding the bass sound I wanted until I realized the otherwise little-used U-220 might have just perfectly gruffy sounds for the job. It did, once I doubled the bass track between a fingered and slap-bass sound. This is my first-ever all-synthesizer song. Oh and there's a hidden message [*] in the song. This is a 30 year anniversary remake of my first-ever song and recording. Once I realized it's almost to the date 30 years since the original, I just felt kinda compelled to do a remake with current equipment. I thought about updating the lyrics for todays world but it didn't feel right so for the better or worse, I ended up leaving the teenage naivete alone. The overall song structure was simplified and shortened though, for the better I'd say. Listening to the original 4-track version first is recommended, if only for perspective. There are fourteen tracks worth of stuff in the new version, it would've almost seemed incomprehensible back then. For some reason I had a really hard time coming up with a guitar solo for this one, and eventually had to settle for planning most of it ahead instead of improvising as usual. Also strangely hard was coming up with a bass line for the verse, nothing seemed to work and still doesn't. Vocals, the electric guitars and the left channel acoustic guitar recorded live, everything else sequenced with Pyramid + Roland JV-1080. In addition to vocals, the electric guitars at center and right channel are played live, everything else sequenced by Pyramid + Roland JV-1080 synths. Also my first original song recorded and mixed in the "full blown" studio I've been building since early 2018 with a proper mixer, separate multitrack recorder, effect rack + patchbays to connect it all. These songs are tailor-made covers for a friends wedding, with vocals by the bride herself. It was a challenging project as I had absolutely zero experience of orchestral arrangements. All instruments sequenced with Pyramid, using Roland JV-1080 and U-220 synths. Once Upon a Dream is originally from the Disney animation Sleeping Beauty, but this version is much closer to Lana Del Rey's cover in Maleficent and served as a somewhat unusual wedding waltz at the occasion. Thousand Years, originally by by Christina Perri, is famous from the Twilight movie soundtrack. The version here is very different from the original, as it is an entirely orchestral arrangement and much shorter to better suit it's purpose as the wedding march. A slow instrumental song. Originally came up with the chorus melody while fooling around with some wild software effect presets of Guitarix in 2017. The sounds in the final version are far more straightforward and no computers involved. I always imagined the song would have lyrics, but eventually realized I didn't quite know what the song is supposed to be about. No wonder coming up with those lyrics felt next to impossible. Recorded and mixed on Zoom R16. Electric guitars played live, solo improvised on the spot, everything else is sequenced by Pyramid + Roland JV-1080 and Roland Gaia synths. An experiment to create some thrash-metal, just so my friends wont get all bored up by them slow lullabies that I keep coming up with. The name is a joke is about the genre name which I still keep misspelling. Recorded and mixed on Zoom R16. Drums sequenced with Zoom RT-234, everything else played live, although in relatively small pieces. As in, lets come up with a bass line for the chorus and record those parts before I forget the line. Repeat for all parts and two to three guitars, and that sort of explains why one guitar harmony is missing - I simply accidentally fast-forwarded the section while recording. And afterwards, I couldn't remember how to play a single one of those riffs or lines. A slow, kinda elevator-jazzy instrumental song. I created the background as an excuse to play guitar solos, but before I ever got the guitar hooked up, the sax somehow stole the show. It's my first-ever keyboard solo of any kind, accidentally improvised on the spot. Recorded and mixed on Zoom R16. Drums sequenced with Zoom RT-234, everything else played live. The soft pad is Roland Gaia synth, piano and sax are from Yamaha YPG-225 keyboard and the electric guitar is the real thing. A moody instrumental, tailor-made for the trailer of my wife's first novel by the same name. My first original composition and recording in roughly 23 years. Recorded and mixed with an open-source DAW software on Linux. This was my first-ever original song project that I completed with a computer setup, and if I can help it, it'll also be the last. Ptui! Managing the level and panning changes would've been a bit of a challenge with an analog mixer, but nothing compared to all the pain caused by latency issues, software glitches, crashes, version incompatibilities and mouse-hand cramps. However I didn't have an analog mixer at the time, and this kind of mix is simply not possible at all on the R16 so I didn't actually have a choice. The DAW is intentionally left unnamed because I think it would be unfair to call it out here, this is simply the name of the game with DAWs. The four-track era has a page of its own.